Tackle heavy pond algae blooms with safe, cleansing ultraviolet light. Makes it simple to achieve clean, clear pond water all season long. High-performance UV bulb ensures professional power while ease of installation and maintenance make it the right unit for new or existing ponds or water gardens. The Oxyful ultraviolet sterilizer is used to destroy single celled organisms such as water borne bacteria and viruses. The sterilizer is also used to control algae and to kill fungi and protozoa. Aqua ultraviolet sterilizers are recommended for both fresh and salt water systems as well as ponds. The ultraviolet lamp emits a germicidal ray which alters or disrupts the DNA or RNA of targeted organisms such as algae, bacteria and protozoa. The aqua ultraviolet sterilizer works better on filtered water. Any debris in the water can inhibit UV transmission. The Oxyful ultraviolet sterilizer can be installed vertically or horizontally. The best place to install your UV sterilizer is AFTER the filter. If it is necessary to install the sterilizer before the filter, adequate pre-filtration should be used to prevent the quartz sleeve from breaking from debris. If your system is installed after the filter and is properly sized, the water should be clear in 3-5 days. If it is installed before the filter, the water should be cleared in 7-10 days. The Oxyful ultraviolet quartz sleeve may need to be cleaned to remove film from the surface that will hinder the effectiveness of the UV. Smooth cam can be easily adjusted with the length of 25-30.5inches. It can be cleaned with swimming pool muriatic acid, lime away or a similar product. Do not use any type of abrasive substance on the quartz sleeve as it may scratch the quartz. 72 Watts, 39 in length. Max Flow Rate: 1585 gallons/hr (6000 Liters). Suitable for ponds up to 15850 gallons 60000 Liters. We Strive for 5 Star Feedback Excellent Service Is Our Goal, We strive to offer 5 Star performance in all areas of our business and want to make sure you are happy with the products and service you have received. We value every customer and will work to ensure your ultimate satisfaction. Please take the time to. So we can learn from you on ways to improve our service. Customer agrees to the following terms & conditions of this sale. Customer will do whatever possible to resolve any issues with us before leaving a bad review or opening a dispute. Customer will trouble shoot any malfunctioning items with us before returning. Unfortunately, we are unable to accommodate local pickups. Unless other was selected on the order. Buyers having APO, FPO or P. Transit time is dependent on the carrier service and cannot be guaranteed by us, sellers are not responsible for services transit time and the information provided is by the carrier and excludes weekends and holidays. This 30-Days Guarantee gives you plenty of time to check items for color, high-quality, and size. The item "72W UV Ultraviolet 39 Sterilizer Light Clarifier Lamp Filter for Aquarium Pond" is in sale since Tuesday, November 28, 2017. 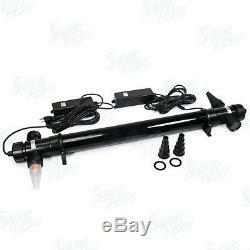 This item is in the category "Pet Supplies\Fish & Aquariums\UV Sterilizers". 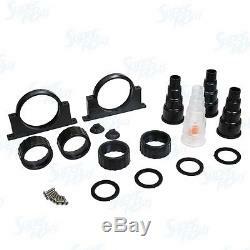 The seller is "supertobuy" and is located in Los Angeles, California. This item can be shipped to United States, Canada.